Suitable for T-REX 550E /600E PRO flybarless system. Extreme low CG and short main shaft design, dramatically reduces flight resistance, effectively improves T-Rex 600?�s 3D performance and speed. Two part detachable main blade grips for ease of maintenance and assembly. New style linkage rod design, complete assembly increases linkage rod rigidity, allowing the pitch slider (follower) to be omitted, resulting in a head assembly that is much simplified and rigid. 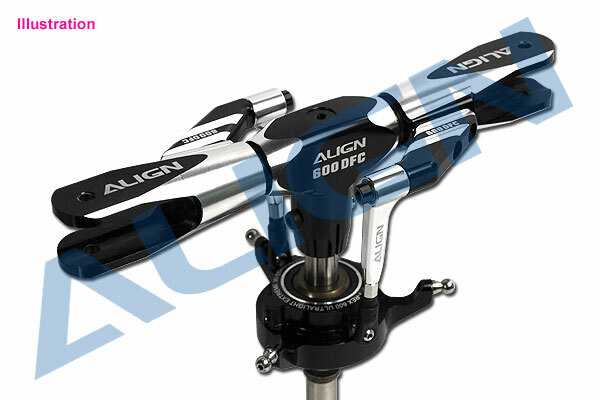 Upgrading to the 600DFC rotor head assembly is extremely easy; just replace the head block included in the 600DFC kit, replace the blade grip pitch lever with the new 600DFC lever, connect the 600DFC linkage assembly, and replace the main shaft with 600DFC main shaft. Existing swashplate and newer main rotor grips are kept in the upgrade.